Back in 2001 game developer Bungie released a game titled Halo: Combat Evolved as an Xbox exclusive. It was met with praise from gamers and critics alike, and thus one of the most popular first-person shooter series was born, and the rest is video game history. In their legendary run with Halo, Bungie made 3 billion dollars off the games alone. The ever-growing popularity bled into other forms of media including, graphic novels, animated features, and action figures. Then, to the dismay of fans everywhere, Bungie decided to bow out and start a new project. They left Halo in the hands of 343 Industries; a studio created for the sole purpose of carrying the series forward. And they did just that. Since Halo 3, Bungie danced around making their fourth entry into the main storyline and filled in some gaps with Halo 3 ODST and Halo Reach. After they handed the series over to 343, the latter decided to pick up where we left off. 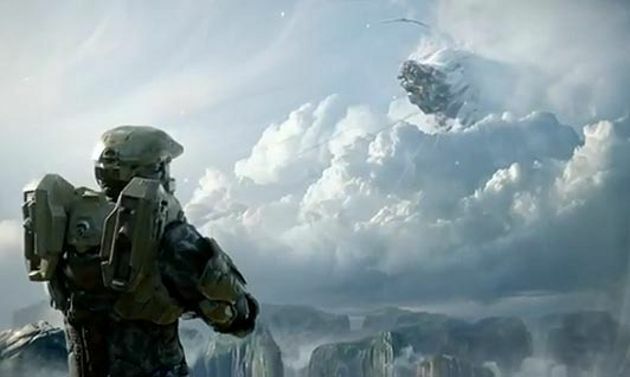 Halo 4 is the first in what’s being called the Reclaimer Trilogy by 343. We finally pick back up with Master Chief and Cortana, stranded in a derelict ship in the middle of empty space. This second trilogy will put the Chief and Cortana on a new planet (or planets), with new enemies, and weapons, old and new, to play with. The big thing going in to such a popular series and changing so much is to find a nice balance between the old, and the new. Keep what fans love about the series intact, while introducing new concepts that will meld with that of the old. The question is; did 343 Industries find that balance and maintain it? I can’t reveal too much of the story for those who are eager to play it. I will say that it does a beautiful job setting up the rest of the trilogy. The Master Chief you know and love is still the no-nonsense soldier who gets the job done, but he’s only human nonetheless. Halo 4 addresses that in a very subtle way. You can feel what’s happening behind the more important events, but it’s never overdone; it never takes over the story, nor does it water down the epic storyline. Enjoy the campaign for sure, because 343 did a fantastic job introducing new weapons and enemies that challenge the player, while making the old concepts feel like an old friend; making you feel empowered and comfortable in the strange new setting. 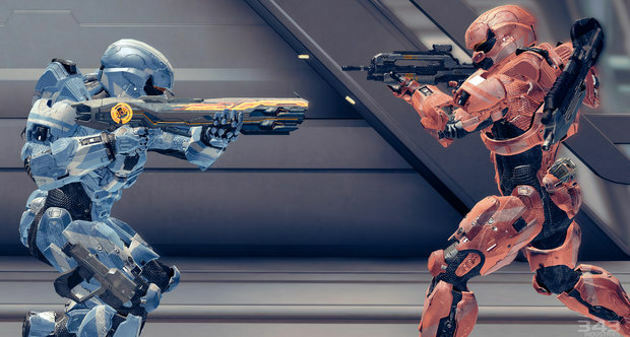 What would Halo be without its core gameplay? Halo Wars, that’s what, and we know how that little venture went. Never fear, because this is Halo at its best. In the campaign, it’s pretty much what you would expect; get from point A, to point B, and kill everything in your way with extreme prejudice. That’s nothing too out of the ordinary. However, the new weapons, enemies, and beautifully designed areas are more than enough to inspire you for at least one playthrough. The new enemies are known as the Prometheans, which are Forerunner constructs. The Prometheans were clearly designed to change up the Halo formula, which has grown a bit stale. 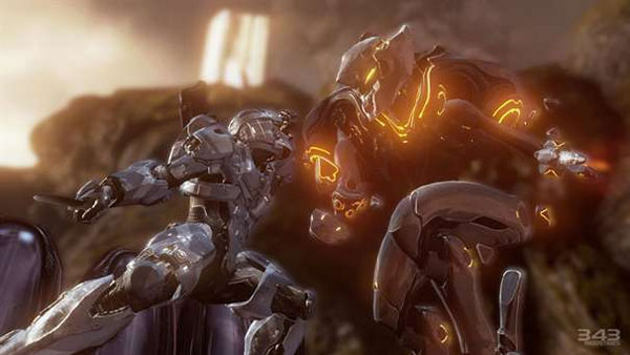 Their abilities to teleport, stick to walls, and resurrect allies make them challenging and very unique to the Covenant. However I found that dealing with them was easy enough by using the same method I always have with the Covenant; shooting them. All that’s needed to deal with the new threat is a change of priorities. That’s not much different than fighting the Covenant. Still, I enjoyed fighting something besides the Covenant and Flood for a change. The best thing about the Prometheans is the weapons they drop upon death. A pistol that can be charged and fired like a shotgun, a super-charged sniper rifle, and a shotgun with ricocheting bullets are just a couple of the new weapons they bring to the table. There are also some new weapons that the Covenant and UNSC brought that are worth your attention, as well as some classics that longtime fans will be very happy with. This is by far that best arsenal to be in a Halo game yet. Halo 4 is definitely the best looking entry in the series to grace the Xbox 360. Explosions look fantastic and rumble your screen, and enemy animations are top-notch as always; the Prometheans were especially impressive. I have to say the environments are the crowning achievement when it comes to graphics. The backdrops are beautifully done and up close everything looks equally as impressive, and there’s no better way to take in the sights than through the Chief’s visor. Master Chief also has an updated model of his armor that looks much better, and the armor to be unlocked in matchmaking has some of the coolest designs I’ve ever seen. You should also take some time to appreciate the menu layout when you’re in the lobby of matchmaking. The whole design of it is just gorgeous. The sounds of a game can be tricky to get just right. They have to accentuate each action and event perfectly to fully immerse the player. Halo 4 does just that, and I mean to say near perfect if not completely. Weapons being fired off, the engines of vehicles flying by, even your own footsteps fully immerse into the Halo experience. This game is meant to be played loudly with surround sound, or a pair of really nice headphones. The soundtrack, recorded by Neil Davidge, is beautiful and intense at just the right moments. I highly recommend the song Green and Blue. Matchmaking has been an important part of Halo since Halo 2, which means it’s slowly been being perfected over time as Bungie has learned from its mistakes. 343 perfected it. No longer does everyone start a match of slayer with the same weapons, you can create your own class with weapons you’ve unlocked. You unlock weapons by leveling up, and spending the credit you get for each level gained. You’ll quickly unlock most of the weapons you’ll want, or use, but that’s what unlocking armor is for. Pieces of armor become unlocked to you as you progress through the ranks. Much like in Halo Reach, you can customize yourself with different colors and insignia. Once you reach a certain level and unlock all the armor pieces for the Spartan IV series, you can then select another series with a whole different style to start unlocking pieces for. There are six or seven different series to unlock, so it will take plenty of play time to unlock them all. Besides the armor and weapon unlocks, you also get medals for achievements like getting one-hundred headshots, or a certain amount of kills with a certain weapon. These get you bonus experience to boost your level progression. All this may seem daunting, but there’s plenty of fun to be had besides the unlockables. The game modes themselves are a blast. 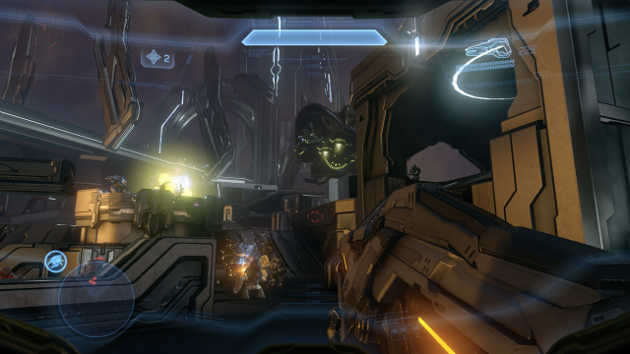 Classics like Swat, Team Slayer, and Grif Ball make a return, while new game modes like Flood are put into the mix. To this date there are still new game modes being added to matchmaking. There’s something for everyone to play. Aside from matchmaking, a new game mode has been introduced called Spartan Ops. These are episodes released weekly that have you and a team of other players playing through a level fulfilling an objective. These give another boost to your level progression, as well as continue the story of Halo 4. Halo has a strong and fiercely loyal community backing it. If there is going to be a problem with the game, they’re going to let you know. After playing a significant amount of Halo 4, I’ve no doubt that 343 listened intently to the fans. This is a fantastic game for newcomers to the series, but a near perfect one for longtime fans. The hype built up around the Prometheans was a bit of a letdown when they didn’t prove to be very challenging for those who are experienced, and the gameplay in the campaign and Spartan Ops is borderline stale when the excitement over the new weapons is lost. Otherwise, this is the perfect Halo game.